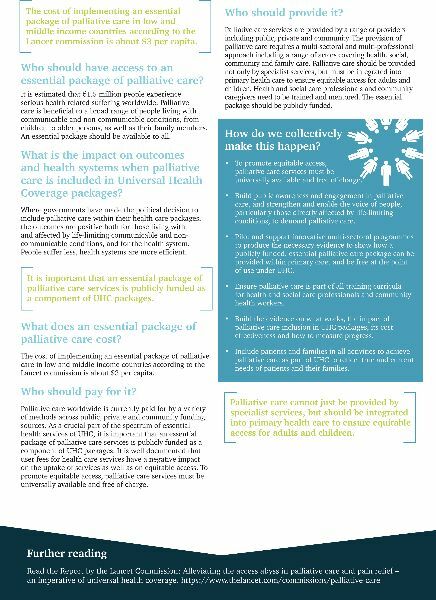 The Palliative Care and Universal Health Coverage Fact Sheet, published in June 2018 was developed by the Worldwide Hospice Palliative Care Alliance (WHPCA), the International Association of Hospice and palliative Care (IAHPC) and ICPCN. 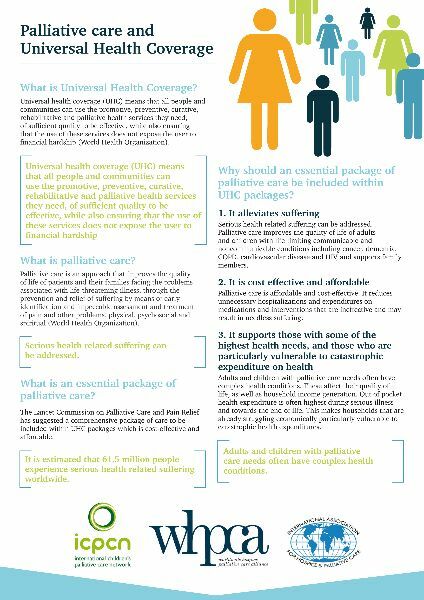 The fact sheet information is based on the findings of the Lancet Commission Report on Palliative Care and Pain relief (2017). This two-page document provides key facts, statistics and recommendations to help in national and international level advocacy. Universal Health Coverage (UHC) means that all people and communities can use the promotive, preventive, curative, rehabilitative and palliative health services they need, of sufficient quality to be effective, while also ensuring that the use of these services does not expose the user to financial hardship.